Mansfield Town progressed to Round 3 of the FA Cup at Field Mill tonight against Conference leaders Grays Athletic. Barker scored an early goal with a fine header, then Grays were unlucky to be reduced to 10 men, before the Stags were awarded a lucky penalty just before half time, which Barker converted. Birchall added a third after 75 minutes. The Stags played reasonably well in front of the live Sky TV cameras but have played better this season and lost. It was also a night when a large banner saying "Haslam Pay the money back NOW!!!" was very prominent in front of the TV cameras (see picture here). 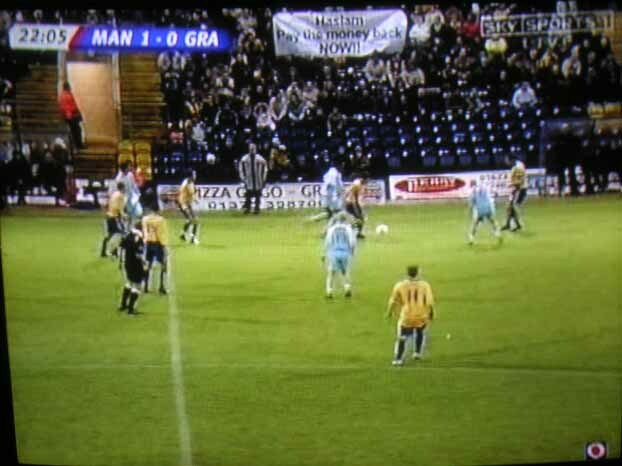 Another banner saying "Keith `Loadsamoney` Haslam pay back your loans now" was also clearly seen on TV until stewards forcibly wrestled it from the protestors (see picture here). The Stags made two changes from the side that beat Stockport, with Russell replacing D'Laryea and Jelleyman replacing Peers. There were positional changes as well with Buxton reverting to right back, Birchall to right midfield, and Dawson to central midfield. D'Laryea was not allowed to play by his club Manchester City. In the first minute, Buxton did very well to make space for himself on the right, and put a left footed cross onto the head of Hjedle, who headed horribly wide from a good position. After 3 minutes, Grays had their first strike as the Stags defence backed off, allowing Kightly to shoot from distance, with Pressman saving well. Three minutes later, Barker played in Birchall, who ran at goal, before sending a disappointing shot wide from 22 yards. Mansfield took the lead after 11 minutes. Rundle's corner from the left, saw Dawson fire a ball into the box, it eventually came to Hjedle whose shot was blocked. The ball bounced around the box, until Buxton headed it across the box, and Rundle's attempted shot was horribly miscued, but bounced up nicely for Barker, who did superbly to get enough power onto his header to get it over keeper Ashley Bayes and into the top left hand corner of the net. Just a couple of minutes later came a moment that was pivotal to the direction of the game. Rundle beat one man in his own half, and tried to play the ball past Sambrook. Sambrook lunged at Rundle, catching the Stags winger on the leg, but the red card that was produced immediately by referee Kettle, was harsh. The referee made another bad decision on 23 minutes, awarding a free kick to Grays on the edge of the box as Jamie Slabber lost control of the ball and ran into Baptiste. John Martin, who has scored against the Stags before when playing for Orient, took the kick and planted it against the left post. At this stage, the Stags were far from at their best, and playing too many long hopeful balls forward. After 39 minutes, a low Rundle corner from the left found its way through a crowd to Barker, whose header was blocked. But the ball was eventually played out to Dawson, and then Jelleyman played in Birchall on the edge of the box. Birchall was barged off the ball by Stuart Thurgood and went down very easily, but the referee generously awarded the Stags a penalty kick. Another poor decision by the worst referee seen for some time. Barker took the resulting kick and mis-hit it into the net, but it had to be retaken due to encroachment by a Stags player. Barker took the kick again and to the joy of the Stags fan, made no mistake as he side-footed the ball just to the right of centre, as the keeper dived the wrong way. After 49 minutes, Grays keeper Bayes made a hash of a clearance. It fell to Barker who sent a volley horribly wide. Grays were the better side in the early stages of the second half, but that all changed on the hour as the Stags had a host of chances in quick succession. On 59 minutes, Barker brilliant headed down Buxton's long crossfield angled pass, and Russell nipped in ahead of keeper and defender, but his flick was a couple of feet wide of the left post. From the resulting corner, brilliantly floated in by the outstanding Rundle, Barker rose above the defence but headed over when it may have been easier to score. Just seconds later Russell broke down the right, put through by Birchall, but his cross was just too deep. Five minutes later, Russell got to the nearpost from Buxton's ball in, and with his back to goal, Russell turned and tried to turn it in, but placed his shot over the bar. Nevertheless a good effort from the loan man. On 68 minutes, the Stags had the ball in the net but it was ruled out for offside. Rundle did well, and played in Coke who had a shot from 22 yards. It was a good strike which the keeper parried, but Birchall had been offside as Coke shot, and although Birchall turned in the rebound, it was rightly ruled out. 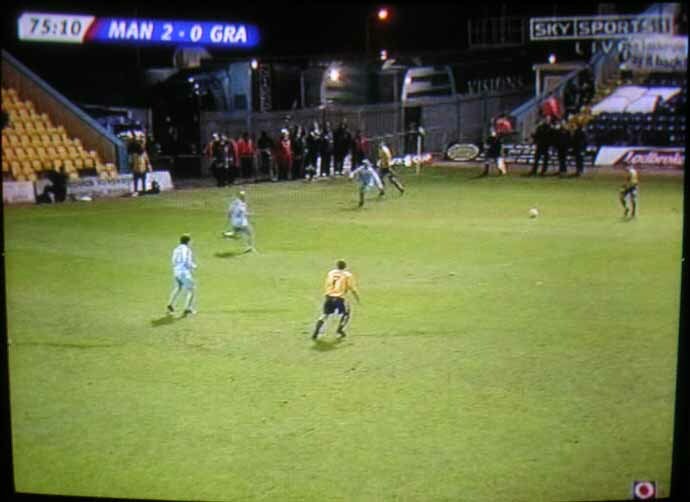 On 72 minutes, Pressman had to be alert to keep out a shot from a tight angle, in Grays' first attack for some time. The Stags broke away and with a 4 on 2 situation, Birchall played in Coke, whose shot was blocked by Bayes. Three minutes later, Rundle put in another brilliant cross which was headed back across goal by Barker, but Hjelde somehow failed to turn it into the net from 5 yards, and then Coke's effort was blocked. From the corner that followed, the Stags made it 3-0. And it was yet another fantastic cross by the superb Rundle. His corner was onto the head of Birchall, who was surrounded by 3 defenders, but still managed to head home from two yards. From the re-start there was a scare for Pressman, as Thurgood tried a shot from long range, which Pressman just managed to scramble past the post with a fumbled save. On 83 minutes, Rundle sent in another fabulous corner which Barker headed over. In the 89th minute, Dawson played Barker through but he was forced wide, and his shot was woeful. A minute into stoppage time, Thurgood fired an excellent shot just wide of Pressman's left hand post, with the keeper motionless. So the Stags progressed comfortably through to Round 3, and got some very good national media coverage, with live TV and second half radio commentary on Radio 5 (commentary available here in full). It was not the Stags` best performance by any means, and there were too many misplaced passes (though it was a difficult night with the wind and a wet pitch), but a number of places put in fine displays to attract attention. Players such as Rundle, Barker, Baptiste and Birchall. Focus switches back to the league, with an away game at Wrexham on Tuesday night. Whatever the glamour of the FA Cup, the Stags` priority is to get away from the foot of League Two. Come on you Stags! Pressman 7 His best game for a while; some good handling and fine kicking. Buxton 7 Good game at right back. Baptiste 7 Never put a foot wrong; always in command. Hjelde 7 Fine game; continues to play well. Jelleyman 6 Did ok at left back. Birchall 7 Some good positive running at the defence; fine header for third goal. Lucky to get the penalty. Dawson 7 Did well in central midfield. Coke 7 Looked composed on the ball. Rundle 8 Some great crossing all night and often beat his man in runs forward. Barker 8 Excellent header for first goal; generally led line well, but some woeful finishing as well, and misplaced passes. Russell 7 Promising full debut. Ran well, created problems for the defence, and unlucky not to score. Not used: White, Peers, Day, McLachlan, Littlejohn. A Bayes, A Sambrook, L Matthews, S Angus, J Nutter (75 G Poole) , M Kightly (45 G Hooper) , S Thurgood, J Martin, D Oli, A McLean, J Slabber. Subs not used: N Eyre, A Olayinka, N Koo-Boothe. Trevor Kettle 4 An absolute shocker, with Mansfield benefitting.